Nex Game Studios has proved capable of developing amazing video games time and again over the years. Their latest creation adds to the ever-expanding Arcane Quest franchise. 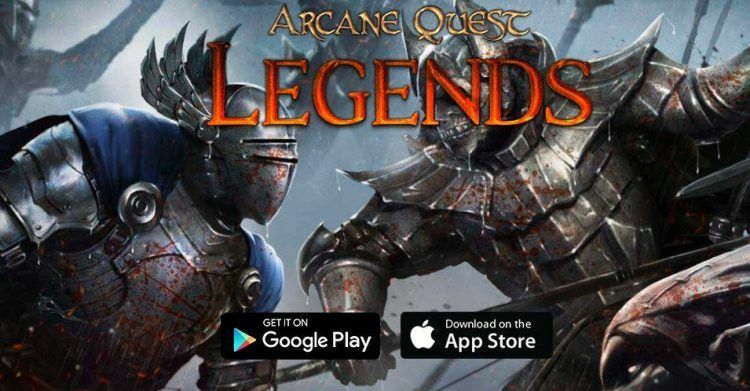 It’s called Arcane Quest Legends and runs on both Android and iOS. Unlike previous versions in the series that featured turn-based gameplay, this title is a full action RPG. The best part is that you can play Arcane Quest Legends on PC and mobile entirely offline. Arcane Quest Legends treats players to a good story. It starts with a scene where your character, a young boy at the time, comes back from the woods only to find his parents under attack. Forced to flee into hiding, he emerges ten years later as a mercenary working for the baron. As the game goes on, you will uncover the mysteries behind your hero’s past. Later on, your character decides to fight the powers of darkness that are wreaking havoc in the Realm of Auria. In Arcane Quest Legends, you will traverse interesting locations in the game world. You can explore tons of environments ranging from caves and forests to dungeons and cellars. All the while, you will be hacking and slashing a ton of enemies. This includes golems, orcs, demons, ghosts, zombies, walking skeletons, and many other creatures. Arcane Quest Legends on PC is divided into acts. The first one is completely free to play. You can get the other acts as in-app purchases to unlock more quests. In addition to a multi-level primary quest, each act has lots of side quests and mini-games to keep you entertained. There are lots of NPCs (non-player-characters) that send players on optional quests, allowing you to forge your own story and make your own choices. After the first scene in Arcane Quest Legends, the game starts with selecting a character of your choosing. You can customize the look of your hero and even select gender. The game lets you play as a Ranger, Wizard or Warrior, but there are no predefined character tiers. Character stats keep improving the more you play. Simply collect weapons, armor and learn new magical spells along the way to develop your hero. Sometimes you may be battling a lot of creatures at once. Getting too close will put your hero in a vulnerable position. In such situations, the best strategy is to fall back slightly and maintain some distance when attacking a horde of enemies. At the end of each quest, your hero earns experience (XP) along with other rewards. You can also earn additional gold coins and arcane stones by watching a video. This will require an Internet connection but you can play Arcane Quest Legends on PC and mobile completely offline. Each act has various checkpoints to arrive at as you complete the quests. The game saves your progress when you arrive at a checkpoint. Therefore, always make sure to exit the game upon reaching a checkpoint if you want to avoid replaying quests all over again. The Acts in Arcane Quest Legends have tons of hidden quests and mini-games. These side quests can easily go unnoticed, especially as you race to finish your primary mission. Luckily, you can go back to areas already visited for some thorough exploration. This will allow you to avoid missing out on bonus rewards. Make sure to keep upgrading your hero in preparation for tougher levels found later on in the game. You can have up to seven active skills at a time along with two portions for mana and health. To acquire new skills and weapons, just keep killing enemies and leveling up. Go to the search box in Bluestacks and type “Arcane Quest Legends” without the quotes, of course. That is it! You can now enjoy your freshly installed copy of “Arcane Quest Legends” on your favorite PC!